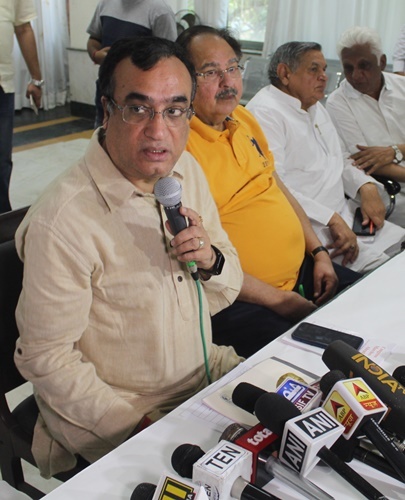 New Delhi: Delhi Congress President Ajay Maken came down heavily on AAP for not resolving and paying much heed to water crisis in the national capital and indirectly providing benefits to the ice and water factories. “Delhi CM Kejriwal has been boasting of providing free drinking water to the people of Delhi, but when there is no water available, how could he give free water to people,” He added. During a monthly meeting of the senior leaders of the party, held at the DPCC office, today, where party leaders passed resolutions to organise save democracy campaign and condemning the merciless beating to death of a dalit youth in Rajkot in Gujarat. “On the direction of Congress president Rahul Gandhi, a Save Constitution Campaign will be carried out throughout the country for one year. The manner in which the Modi Government at the Centre and the BJP-ruled States tinker with the Constitution drafted by BR Ambedkar, it was clearly a deliberate attempt to weaken the Constitution. The Delhi Congress will hold public meetings at 19 Assembly constituencies to expose the Modi Government’s bid to weaken the Constitution,” Maken said. John Abraham & Diana Penty lead Parmanu Pride Parade at Connaught Place in New Delhi!